2017 was a superb year for ride sharing giant, Go-Jek. From partnering with Indonesia’s conventional taxi behemoth, Blue Bird Group, to acquiring not only one but two but also three fintech companies to sum up this year. Aiming for diversification under one roof, the Founder and CEO of Go-Jek, Nadiem Makarim is surely one hell of a hungry man. 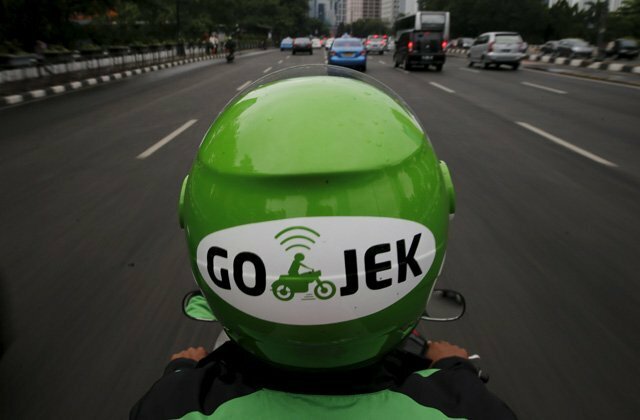 With 15 million active users per week serviced by 900,000 Go-Jek partners (drivers and vendors), Go-Jek has more than 100 million total transactions per month from their various services. Certainly, the numbers shown above successfully draw investors to pour more money into Go-Jek. And definitely, they really know what to do with it. Hooking up the leading taxi company, Blue Bird as a part of their plan in transforming their ride-hailing services, a project called “Kolaborasi Anak Bangsa” already covered 5 areas including Jabodetabek, Bandung, Surabaya, Medan, and Semarang. With Blue Bird’s fleet of 35,000 vehicles and Go-Jek app having been downloaded no less than 40 million times, these 2 transportation giants combined forces for a shared vision: to give their best to the community. You can order that “blue-sky taxi” from Go-Jek app now. Still around the same time, this digital on-demand service company also weaved a collaboration with BTN (Bank Tabungan Negara). They collaborated with a mission to help the partners have their dream home. Partners can get a micro-credit worth IDR 75 million that can be used to buy, renovate, or build a new house. Go-Jek will recommend partners who have great performances and great feedback from customers to BTN. Partners also need to have savings on BTN at least for 3 months. With this collaboration, Go-Jek hoped they can help their partners to make a better future. Going back to the apps, Go-Jek also succeed in getting bigger by strengthen their one of their services by acquiring an event management and ticketing company called Loket last August to manage Go-Tix, Go-Jek’s own ticket and entertainment platform. Clearly, Go-Jek management doesn’t like to talk about numbers since they almost never release the amount of their partnership or acquisition. Now, with more than 125,000 merchants having joined forces with Go-Jek, Nadiem successfully upgraded the life of the partners and simplify the life of modern society. Now he’s setting his eyes on one thing: payment platform. According to Nadiem, the company’s focus now is the digital payment services or electronic money. Go-Jek would like to expand their Go-Pay function so it can handle offline and online transaction. For example, recently Go-Jek has just launched Go-Bills, where customers can use Go-Pay to pay for bill payments, initially for electricity and BPJS Kesehatan as a national healthcare insurance. But it doesn’t stop there. The grand plan is to make Go-Pay a standard payment service to most of Indonesian population who don’t have access to traditional banks. And what do you think Nadiem will do to fulfill that plan? In their press release dated December 15, 2017, Go-Jek stated that they have signed an agreement to acquire Indonesia’s three fintech leaders: Kartuku, the leading offline payment service in Indonesia; Midtrans, the biggest online payment gateway company in Indonesia; and Mapan as the leading local community group-based saving and lending network. Collectively, the businesses currently process close to USD 5 billion of debit card, credit card, and digital wallet transactions for its users, services providers, and merchants. As a result, Go-Pay will play a major position yet other payment methods will still be supported by Mapan and Midtrans. These acquisitions was aimed to help customers to enjoy variety of payments that are suitable for them. These acquisitions mark a significant evolution in Go-Jek’s journey from ride-hailing app to multi-platform technology group that leads in payment services in Indonesia. While now serving under Go-Jek Group, Mapan and Midtrans will continue to pursue their respective visions in online services while Kartuku will immediately accelerate the acceptance and market leadership of Go-Pay in the offline space through them. Henceforth, Go-Pay will allow to better serve their user base and accelerate each of their missions. Bottom line, what Go-Jek did in 2017 signaled the beginning of a new era of cashless economy, in which you don’t need to use cash to pay your needs but as simple as one click from your gadgets. The acquisitions was strategically smart moves as they will be covering most Indonesia’s areas. But really, Nadiem just don’t know how to stop growing this giant as we also heard a rumour that Go-Jek plans to expand to three to four countries in Southeast Asia in 2018, escalating its rivalry with Grab and Uber Technologies, Inc.